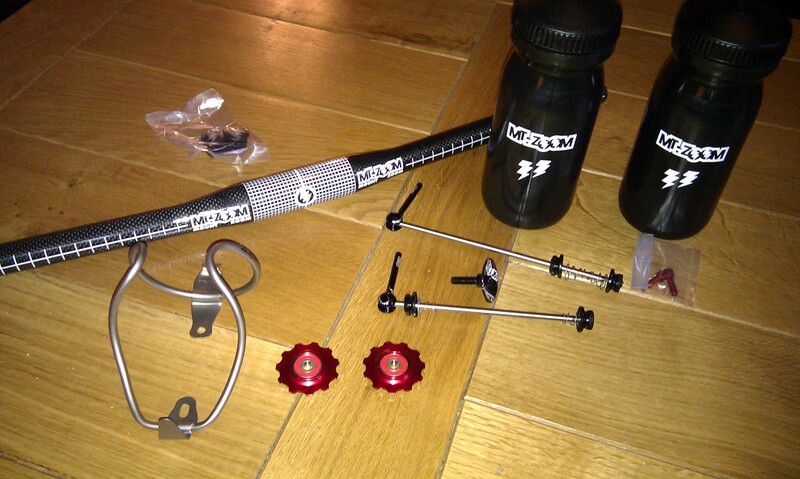 Ant at the XC Racer shop has sent me some nice kit to help shave even more grams off the TD:1. He’s importing Mount Zoom components, clearly aimed at the lightweight end of the market. It’s all really bloody light. He’s kindly sent me some bars, jockey wheels, a bottle cage, carbon spacers, some wheel skewers (that weigh NOWT) and a couple of bottles and they all look really lovely. Deb thought that someone had posted me an empty box when she collected it from the post office for me. The bottles come with a little Mt Zoom logo’d elastic band so you can grab a bottle with a gel attached when you’re in a hurry. I know I know, it’s just an elastic band, but it’s nice to know someone’s thought of it.